I have a question that im hoping to get some clarity on. I am about to re-scape my 215L Aquaone AR-980. Currently it has an inert gravel and a crap load of Anubias, some crypts and moss. Live stock is around 20 RCS, 20 neons, 3 Siamese Algae Eaters and a Dwarf Honey Gourami. I would like to get the re scape done within the day and have a second tank im planning on putting the live stock in whilst the new scape stabilises, this tank is 65L and I was thinking of using at least 50% of the old tank water in it to reduce shock. I plan on having new plants purchased and in my hands before I pull the trigger and do the tank move and re-scape so the new scape is heavily planted from the start. The part that has be slightly concerned is im moving from the inert gravel to an Elos substrate so im expecting to cop a ammonia spike so the live stock will have to probably stay out of the new tank setup for a while, spare tank will house them in the short term. My biggest concern is while I re-scape the tank I expect to have the overhead filter off for a few hours so im not sure if my beneficial bacteria colonies will die off. One thing I thought I could do is syphon the tank water into by bath and setup the overhead filter in the tub and keep the filter running in the tank water whilst I relocate, re-scape and setup the tank. But I have no idea if this would be worth it. Ide like to minimise the risk of the tank crashing and having to cycle from the beginning but as this will be a planted tank mainly im thinking it might be the easiest thing to do. Mind you, the 65L spare tank with the live stock will not have a filter and I plan on checking the water daily to ensure its ok.
Im planning on using the old inert gravels to build substrate height at the back, it will be capped with the Elos so im not expecting any beneficial bacterias from the gravels to be on any real benefit. Unless I use some of it bagged in a stocking and hang it in the water column. Some of the old gravels has green spot algae so i was thinking of bleach washing it or heating it in a pot (not bringing it to complete boil) to give it a proper clean since it will be capped in the new setup. Filter beneficial bacteria colonies dieing off is my biggest concern as I can see the re-scape taking me a few hours to do. Tank is being moved within the house, backing image is being removed and replaced with frosted vinyl and then the re-scape work needs doing and planting. Can you move the overhead filter to the spare aquarium? Or as an alternative, other than using your bathtub (be mindful of all the products you use that can be harmful to not only the bacteria but the fish too) would be to buy or use a big plastic container and dump the rest of the water there with the filter. Try to rescape the tank with the little water possible, or else it would be a mess (trust me, I've just done it and it's PAINFUL haha). 3. scape new tank completely dry after you remove all water. 7. make a check list of everything needed for the rescape so that you don't need to run off to get this and that during the event. 8. Make sure new tank is water tight prior to doing anything. I concur with above. The overhead trickle filter is tricky though. However you could move the filter media into a spare cheap filter like HOB or so. Probably not a bad idea to have a spare filter anyway. My biggest concern is keeping all those fish in a 65l tank esp if those SAE are fully grown. I didn't realise you were using the trickle filter. You can still connect this to the 65L tank. It will need some flexible hosing and a platform to hold it slightly above the 65L tank. Otherwise you can put media in a canister filter ( Do you have one? ) and run it in a bucket but might as well run in the 65L tank with your fish. Thanks for the replies guys, I appreciate it. The trickiest thing with the AR-980 filter is its size. Its 1 meter long and only 150mm ish wide, hence why i was thinking of the bath tub to keep it running. The spare Aquaone Aquastart 500 tank is not even half this width so the option of running the old filter in the spare tank just wont work (hose option to route the outlfow back into the tank is a good idea but i think ide rather buy a big tub if I was to not use the bath). I was thinking with the bath tub I would sterilise it with a bleach clean before I siphoned any tank waters into it and give it at least 1 day to dry out after the bleach clean and using some water dechlorinator on it. At present its got my hardscape soaking in it. With the live stock, im not too fussed if I loose it. I know this sounds terrible but I was half planning on changing some of the fish at some stage anyway. I want to keep my RCS and the Siamese Algae Eaters (2 months old) tho so was hoping to get the Siamese into the new scaped tank as soon as the water indicates I could and the RCS not too long after. I was actually talking to the wife about a dedicated shrimp tank and I reckon the 65L will end up being that tank, 2 tanks in the house is pretty much our limit. I dont know where ide set up a 3rd lol. I dont have a filter for this tank just yet, it will get a canister filter in due time but I dont have the cash for that just yet hence why this tank isnt quite where I want it... I could get a cheap internal filter which would provide a backup further down the line if either tank encounters problems. At present this is my plan (preparation work): Get test water into the old 65L tank this weekend to ensure its all a ok and no leaks. 1. RCS: shrimp are being moved into a breader tank thats suction cupped to the inside of my current AR-980 tank. This will make relocation easier and any babies will be contained as some of the RCS are berried. 2. Hardscape is soaking to remove tannins and get it to sink. It sinks now so just keeping it submerged for as long as possible to leach out tannins in the tub prior to d-day. 3. Frosted vinyl is in the post and will be ready to replace the blue backdrop of the tank well ahead of time. 4. Scoop out some of the gravel and prep it for use in building height in the new scape. These gravels im all ok with loosing the BB on, they are purely to build sub height. 5. One of my last steps, remove all Anubias from current logs as the logs will not be used in the new scape and bleach clean the Anubias to remove the green spot algae. 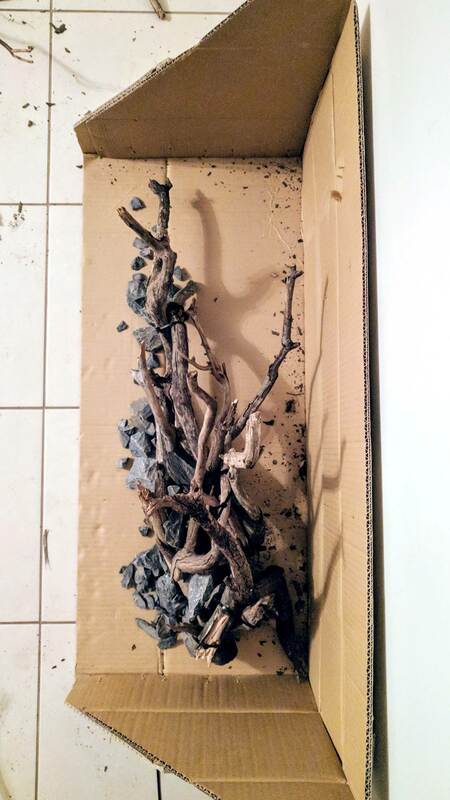 Note: ive already done this to my smaller pieces but the plants on the larger logs will need to be cut and made into new plants as some of the rhizomes are 150mm long so the plants could do with some separating for use in the new scape design. 2. move filter to bath tub and setup to remain running. 4. tear down old hard scape and empty out tank for move. 11. move filter from tub to tank and get running. 12. check water in upcoming days weeks to ensure its ok before adding in the Siamese Algae Eaters. Rebel: if I was to pre-cycle the elos sub for 2 weeks to try and avoid the ammmonia spike should this be done in a large volume of water or a bucket? I assume you would want the sub as thinly spread as possible so it can pre-cycle properly. I guess you could stir it every day. I was thinking of doing it in 2-3 buckets. Here is the comparison. 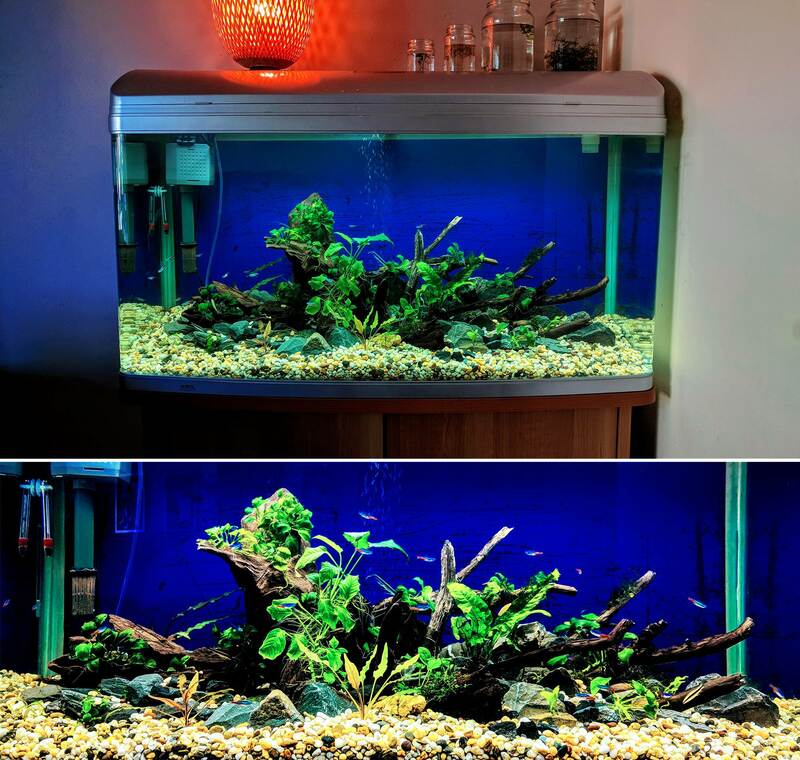 Top pic is the current tank. Note the pump head top left. I can attach the filter end to the power head and eliminate the pipe so I will only need about 200mm of water depth to keep it fully submersed while im in tank transition. 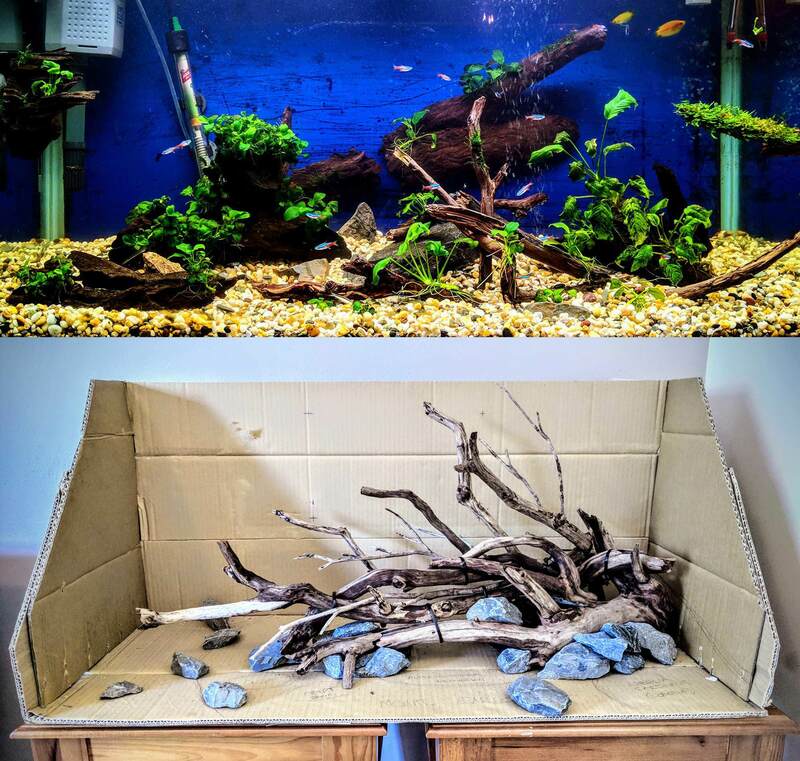 Bottom pic is my new hardscape in the scapebox. Last edited by FishyFellow; 11-10-18 at 07:21 AM. For Elos sub, you can just spread it outdoors as a 1cm thick layer. Just water it daily for 2 weeks. With the new scape, consider moving it forward by about 10 cm or so. This will give you enough for the background and will add depth. Thanks Rebel. Good idea with the sub. The hardscape from above. The left side (top in this pic) has heaps of space, the right side (bottom of pic) is quite tight. Ill definitely move this closer to the front of the tank to give the back more flow. I plan on planting java fern in the right hand back portion so some more room there would be beneficial. Note the piece of wood that protrudes into the back right hand cover has been cut short as its zip tied to the main cluster and that foot portion wasnt needed. The hardscape is tall but ive kept it as narrow as possible so it dosnt chock up space from front to back. Im still about 3-4 weeks off pulling the trigger on this project so ive got time to get all my duck in a row. Last edited by FishyFellow; 11-10-18 at 08:21 AM. Personally I would ditch the SAE's. They always end up being more trouble than they are worth. I really like the hard scape. Just make sure not to bury the rocks too deep. You don't want to hide them too much. I think a big school of tetra's or similar would really suit the new look. You should start cycling the substrate ASAP and soak the wood so it is already waterlogged when it comes time to use it. The reason i want to use my old gravels is to prop up the centre and right hand side. I have some cut up plastic grid for the hardscape (thats behind the rocks on the right under the very end of the wood) but plan on using the gravel to create height for the rocks and main bed. Then simply spread the sub ontop of that. So imagine that hardscape and rock design raised a few inches on the right from how it is in the scape box. Thinking about how im going to cycling the sub. Would using a few buckets with the sub spread between them be ok. I actually have a big tub about 850mm wide that I could use and get it all in there. I dont think ill have the space to do Rebels method of spreading it out 1cm thick and wetting it daily, not enough space to set it up for a few weeks. I was told, and have read that Elos sub creates less of an ammonia spike compared to ADA Amazonia so im hoping this is true. When cycling the sub, should you bother with water changes every few days to refresh the ammonia levels to stop it being absorbed back into the soils? Hardscape hs been soaking for a week already, as of yesterday its finally waterlogged. Just keeping it submerged to release tannins in the tub vs tank till its time. Last edited by FishyFellow; 11-10-18 at 11:07 AM. 1cm was just to maximise the effect and access to O2. When cycling, O2 is most important. With water changes, you will replenish O2. Ammonia won't get absorbed back. Ie that big tub will be fine to just spread it out. If you water lightly, then the sub will have access to more O2 that's all. I had to do a bit of maintenance on this tank over the weekend so took the opportunity to get the re location within the house done and tear down the hardscape. I did not pull the trigger on my new hardscape just yet as I have left the gravel in the tank. I needed to crack open on of my extra bags when doing my 65L tank, oh well. When I re scape this one I want to do it properly so thought ide get a compromise in place. Using everything bar the logs that were suction cupped to the glass in my pic above I managed to scape this in a similar island style to what im planning in a few months time. The gravel still drives me mad but from a simple re arrangement of what was already in the tank im pretty happy with it. Ive got a few plants from my 65L that will be going in soon, pygmie chain sword and I reckon ill get some amazon sword for the back but I reckon this basic scape will stay like this till my Christmas holidays. You have the eye for composition. Nice work!! Love those mossy containers up top. I drive my family crazy with those.